Clifton Forge, VA (Oct. 22, 2018) - On Saturday, November 3 at 7:30 pm on stage at The Historic Masonic Theatre, three Hall Of Fame musicians will appear in the John E. Hillert Auditorium. 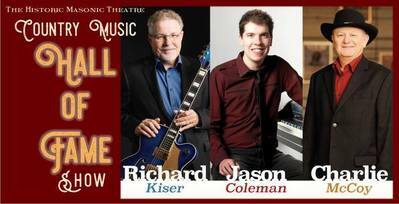 The Country Music Hall of Fame Show features musicians Richard Kiser, Charlie McCoy and Jason Coleman, grandson of renowned Hall of Fame piano player Floyd Cramer. Guitarist Kiser, a Chet Atkins protégé and member of four halls of fame, tours about 140 shows per year around the country and works with schoolchildren regarding bullying, drug use and the need for abstinence. He is a strong supporter of Wounded Warriors, for which he does several shows per year pro bono. Among other honors, he has been named the International Country Gospel Music Association’s Instrumentalist of the Decade and was recently inducted into the Country Gospel Music Hall of Fame. Charlie McCoy is a living legend on the harmonica. He has been a fixture in the Nashville recording scene for more than 50 years and can be heard on recordings with Elvis Presley, Frank Sinatra, Roy Orbison, Bob Dylan and others. In addition to the more than 12,000 recording sessions he has been a part of, Charlie has released over 35 of his own albums. He also served as the musical director on the popular TV series “Hee Haw” and currently tours in concerts across the U.S. and around the world. Charlie has won one Grammy, two CMA Awards and seven ACM Awards, and in 2009, his induction into the Country Music Hall of Fame was further proof of the lasting impact he has made on the music industry. The unique combination of Jason’s piano, Richard’s guitar, and Charlie’s harmonica simply has to be heard rather than explained. Each artist’s unique style is put in the spotlight through the fun, familiar songs they play – and when their styles are put together, the result is something truly special. This show is so popular on tour that it regularly sells out. Get your tickets today. Tickets: $20/18/15 and may be purchased online at http://www.historicmasonictheatre.com, at the Theatre Box Office by calling 540-862-5655 and at the Ticket Booth one hour prior to the show. For more information on the 2018/2019 Season of Events at The Historic Masonic Theatre, please visit the Theatre website and/or Face book page.